Self-confessed Boston Strangler Albert DeSalvo (left) was seen minutes after his capture in 1967. He was buried in Peabody in 1973. Former priest John Geoghan, accused of molesting children, was buried in a Brookline cemetery. Outside a Worcester funeral home, where the body of ­Tamerlan Tsarnaev lies, protesters have lashed out in ­anger. One called for the ­accused Boston Marathon bomber to be fed to the sharks. Another vowed to never set foot inside the funeral home again and said she would leave Massachusetts if the body is not sent elsewhere. “I don’t want to even live in this state if he is buried here,” Jennifer Merchand, 29, said Monday. Yet a number of reviled, ­infamous figures, from Boston Strangler Albert DeSalvo to defrocked priest John Geoghan, have been laid to rest with minimal outrage, typically in private ceremonies that drew little attention. 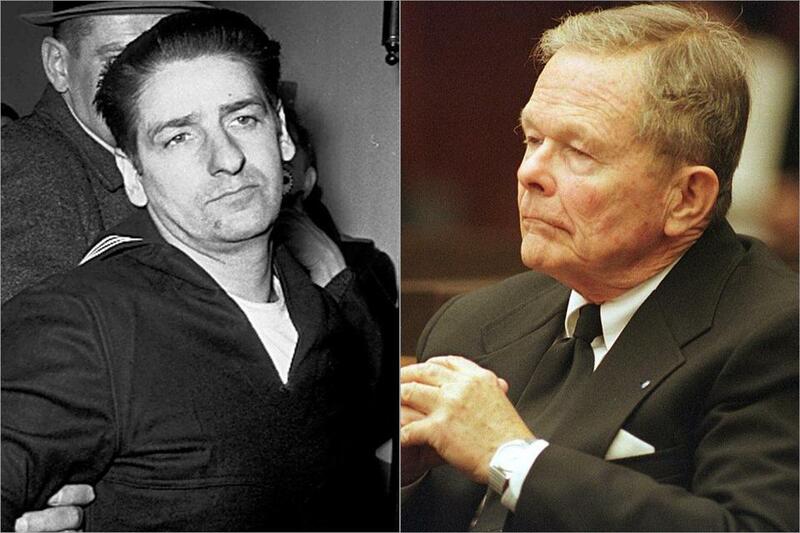 Geoghan, who was accused of molesting about 150 children and became a symbol of the clergy sexual abuse scandal, was buried in a Brookline cemetery, the burial site of former Boston mayors and several members of the Kennedy family. Geoghan, who was killed in prison in 2003, was buried with no protests after a private funeral in West ­Roxbury. DeSalvo — the man known as the Boston Strangler, who admitted to 13 murders — was buried in Peabody in 1973, ­after he was stabbed to death in his cell as he slept. More recently, Newtown gunman Adam Lanza, who killed 27 people before shooting himself, was laid to rest privately at an undisclosed ­location, according to published reports. While the depths of public outrage over the Marathon bombings, which killed three people and wounded more than 260, has little precedent, particularly with emotions still raw from the attack, the past burials lend context to the current controversy, which has sparked intense debate. Municipal graveyards set their own policies and are ­under no obligation to accept burial requests, although denials are highly unusual. On Sunday, Cambridge officials said they would not allow ­Tsarnaev to be buried in the city cemetery, and several ­other cemeteries have done the same. Tsarnaev’s mother wants his body returned to Russia, but his uncle has requested he be buried in ­Cambridge, where Tsarnaev lived. On Tuesday, a spokes­woman for Boston’s mayor, Thomas M. Menino, said it would be “disrespectful” to Boston residents to have ­Tsarnaev buried in the city. But some funeral directors said they could not recall a burial in Massachusetts that has drawn protests or presented any type of distraction and said everyone is entitled to a proper burial. “There are convicted murderers buried in Roman Catholic cemeteries,” said Bob ­Biggins, a funeral director in Rockland and past president of the National Funeral Directors Association. Presidential assassins have also received burial. Lee ­Harvey Oswald is buried in a Fort Worth cemetery, where workers are forbidden to provide the location of his grave. Several infamous mass murderers, including Ted Bundy and Jeffrey Dahmer, were cremated. Timothy McVeigh, the Oklahoma City bomber who was put to death in 2001, was also cremated. Six years later, John Salvi, who killed two receptionists at abortion clinics, was buried in Peabody after killing himself in his prison cell. In a eulogy, a minister described Salvi as a “troubled young man whose uncontrollable emotions drove him to act irrationally,” according to a published report. “We can’t judge what transpired in his troubled mind,” the Rev. Lawrence Wetterholm said. In 1927, anarchists Nicola Sacco and Bartolomeo Vanzetti were cremated at Forest Hills Cemetery in Boston after their execution. Their ashes were later returned to Italy. Five years after the Cocoanut Grove fire, a 1942 nightclub blaze that killed nearly 500 people, club owner ­Barnett Welansky died and was buried in Woburn. Peter Schworm can be reached at schworm@globe.com. ­Follow him on Twitter @globepete.